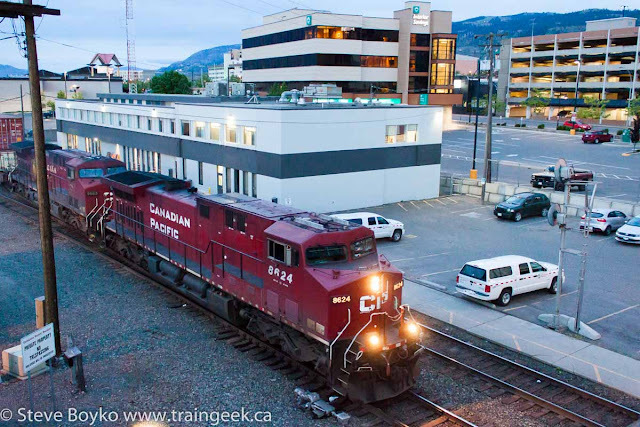 This is the sixth and last in a series about a May 2015 visit to Kamloops, British Columbia. Start at the beginning. 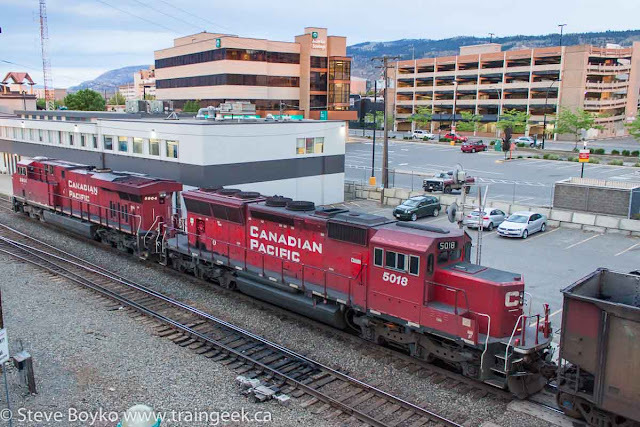 After seeing the Rocky Mountaineer off, I returned to downtown Kamloops to see what was going on with CP. At 20:15 I found a crew that apparently had just put their power away. 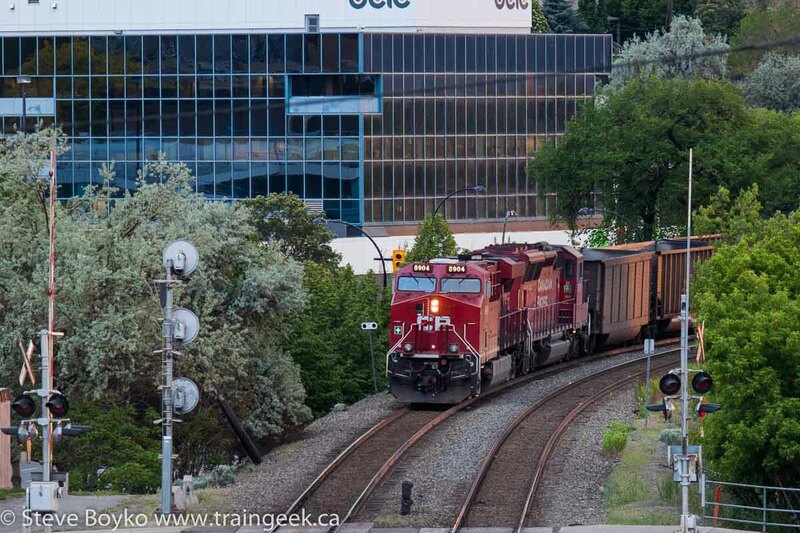 Facing west from the same pedestrian bridge, I saw CP 8904 at the head of a coal train waiting to enter downtown. 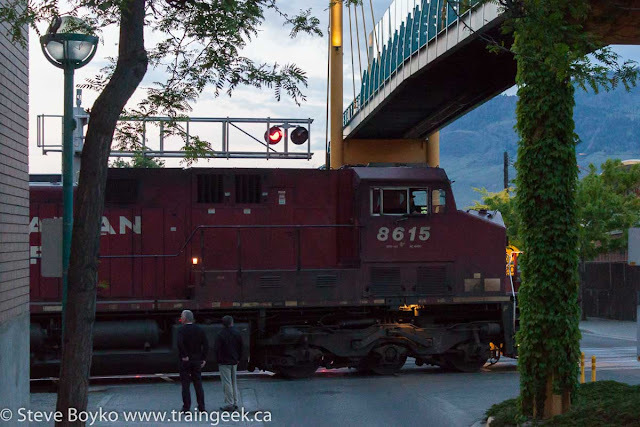 Kamloops is a crew change point and they switch crews right beside the pedestrian bridge. Here's 8904 pulling up to the office to swap crews, from ground level this time. 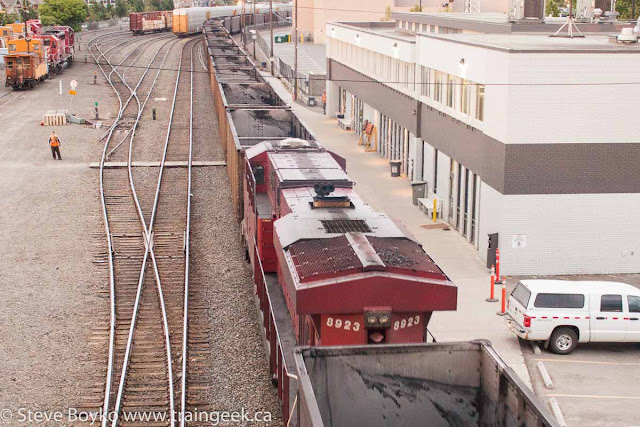 On coal trains, CP seems to run a toaster* in the lead followed by one of the SD30C-ECO units (refurbished SD40-2 units). They then have another toaster as mid train power and one more on the tail end. I saw this combination multiple times during my times in Kamloops. * toaster = squarish, boring locomotive aka AC4400CW or ES44AC. A derogatory railfan term. Finally, end of train toaster (CP 8915). I like the SD30Cs but the endless parade of ES44s and AC4400s... 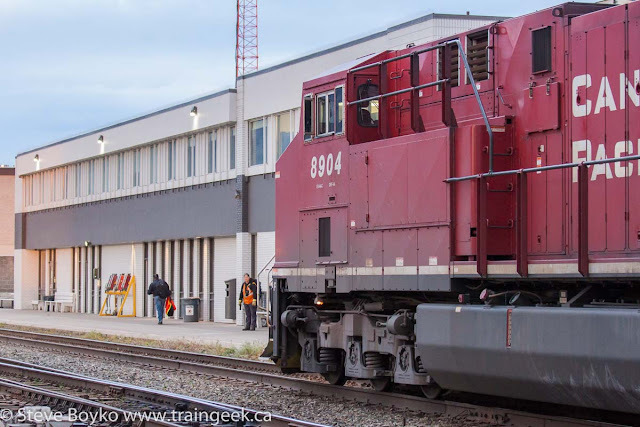 I don't understand why some people say CN has no variety in its locomotives! 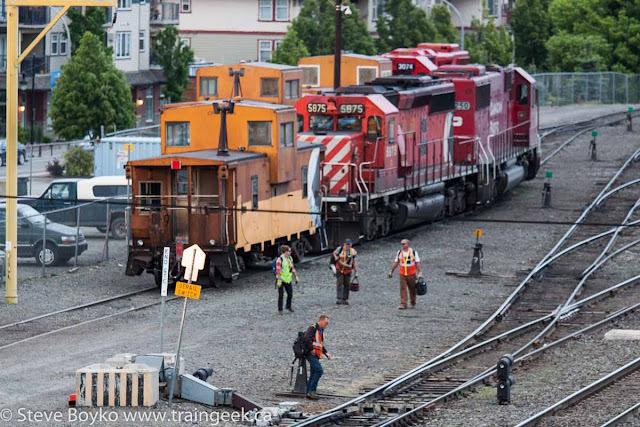 After they passed, I walked down to the parking lot visible in the distance to shoot a side-on view of the parked locomotives. I was especially interested in CP 5875 with its multimark. I think I had the camera on my monopod, on a timer, holding it up over the chain-link fence. Better than trespassing! 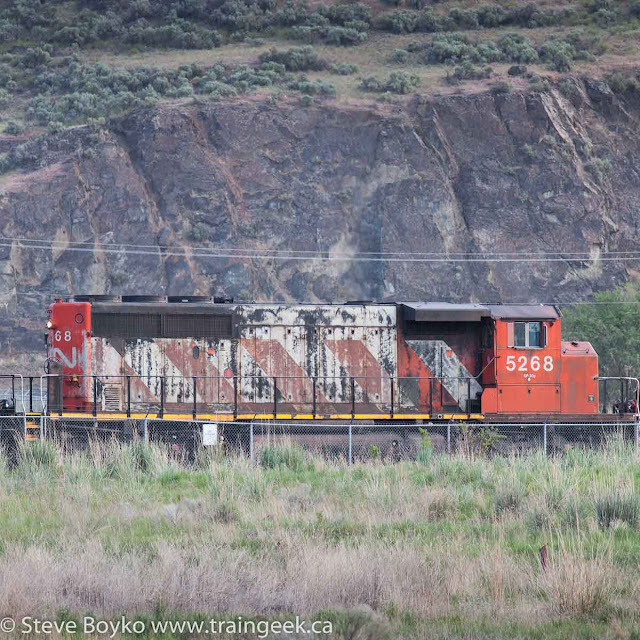 I shot CP 6250 as well but the angle wasn't as good. After that, I wandered over to a nearby ice cream shop to top up my energy. As I walked out, I heard the tell-tale thrum of big diesels and ran to the crossing to find CP 8615 pulling up for a crew change. You can see a piece of the pedestrian bridge that I was standing on for several of these photos. The plexiglass barriers make it a bit challenging to photograph from some angles, but you can jam the lens in between the panels if necessary. I suppose they are there to discourage littering. By this time (20:45) the light was getting dim. I was using a shutter speed of 1/20s so there is some motion blur. Note that 8615 (with 8754 and 8922) was meeting a westbound freight in the yard. After the tail end passed, CP 8624 (and 9683) throttled up and rolled on by with its intermodal cargo. I packed it in for the night after that. I didn't railfan at all on May 14th - shocker! 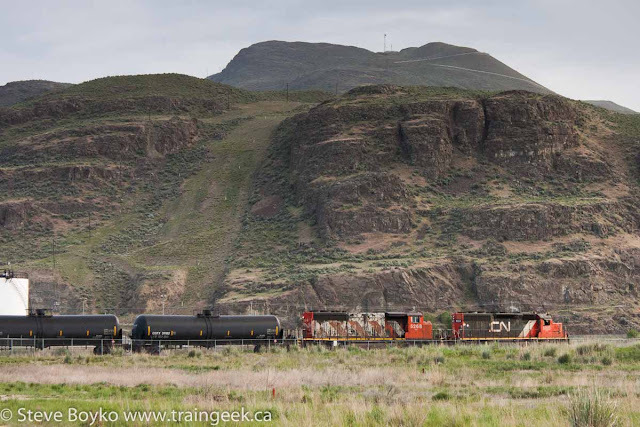 - and I didn't intend to railfan on May 15th, but while driving to the airport I spotted a pair of CN locomotives switching the fuel facility by YKA (Kamloops airport). I grabbed a couple of quick photos before returning my rental car and boarding. CN 5268 and 6023 were shuffling tank cars around. PS - My flight back home was pretty uneventful. 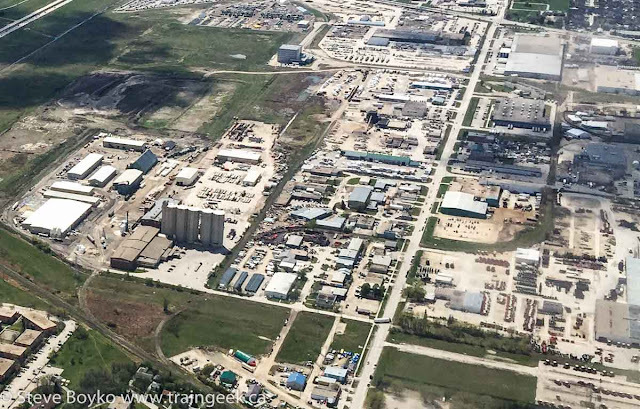 As we descended to land in Winnipeg, I photographed the Fort Garry area with my iPhone. You can see the former Manitoba Sugar property on the left, the CN Letellier subdivision across the bottom left of the photo, and Chevrier Boulevard running up through the middle of the photo. Thanks for reading about my Kamloops adventures! 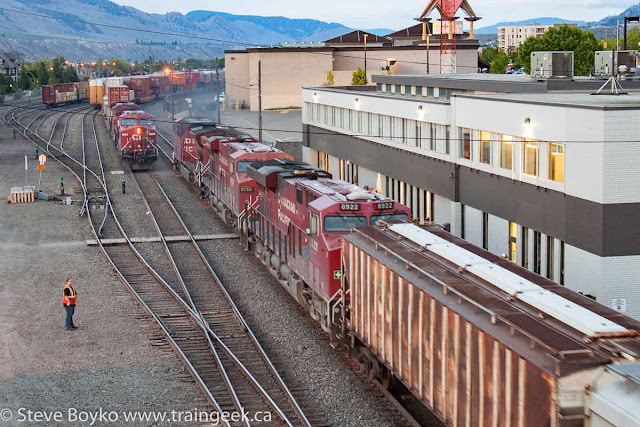 You can start back at the beginning or read all my Kamloops stories. I'll be posting about my grain elevator adventures in northwest Manitoba soon... stay tuned. That looks like a trip well spent. I think the CP power mix is awesome. What I wouldn't give to see more of it these days. Hi Steve, Thanks for your report on your visit to Kamloops. 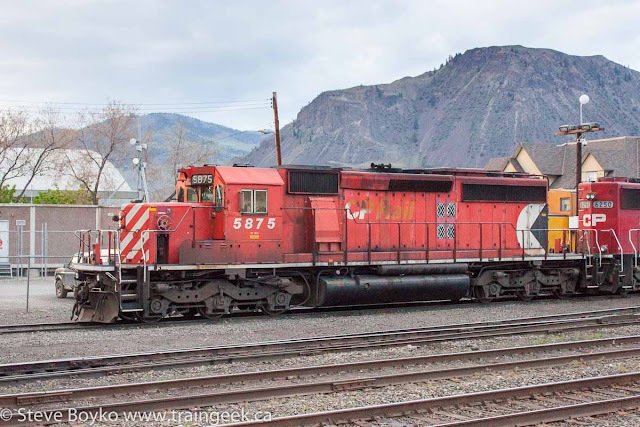 I have been fortunate enough to get to railfan Kamloops twice. First in 1991 and again in 2001. The viewing platform (pedestrian bridge) at the end of the CP yard is an amazing viewpoint to watch the action below, but can be frustrating for photography (as you pointed out). 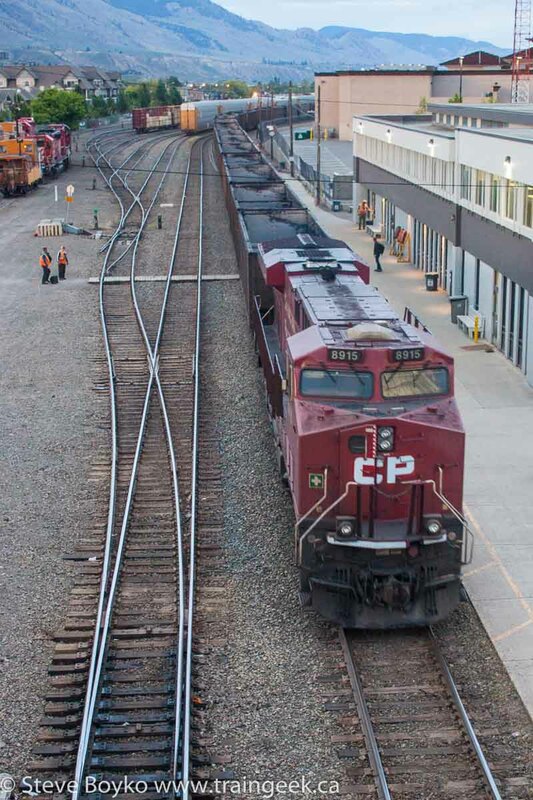 The crews and workers at the CN yard across the river were friendly and helpful and very proud of their railway. Great area to watch trains for a day or two. Karl, thanks for reading and commenting! Hi Andrew, I'm glad you were able to visit Kamloops a couple of times. Did it look different then from what my photos show? Then, in our usage, there are two types of toasters: four-slice (like a VIA P42DC) and six-slice (like any of the CN or CP units). I did not know there was such specificity for the "toaster" nickname, Pat! Thanks for that... I learned something :) I've never heard of a P42 referred to as a toaster. Those shots at Wallachin are spectacular! I'll have to try to get there and see what I can get. Thanks for the tip! Also, the picture of the coal on the rad fans is not the DB fans. The DB grids are right behind the cab on the GE's.